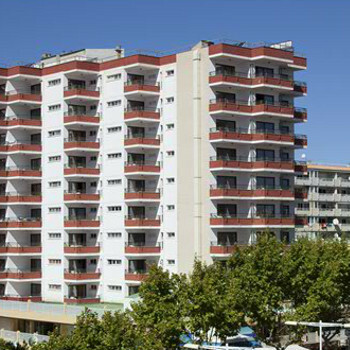 Situated in the cosmopolitan area of Magalluf, just a few metres from the beach. Near the complex are bars, restaurants, shops and nightlife. Services provided are of the highest standard. For what you pay, this hotel is excellent value for money! I had no illusions on arriving that this was a 5* hotel. Staff were friendly enough, the maid only cleaned our room once, we were however only there for 4 nights. Rooms are spacious and easily slept 4 people. My one and only complaint about this hotel is that the room we had didn't have a kettle. There were a few steps to get up before you reached the reception and with heavy suitcases and a bunch of lasses this was no mean feat, but it was manageable, and the lifts easily held 2 people and 2 suitcases. The bar below the apartments made us feel so welcome and that's where we had our breakfast and lunch every day, I would recommend this bar to anyone who is staying at Sol Y Vera apartments. The pool wasn't Olympic size, but we found it very clean and enjoyed our lazy liquid lunches just lounging by the pool sunning it up. If you're expecting a top notch hotel, then you will be disappointed, but if like us you want somewhere to shower and sleep, then this hotel is the place to stay. Arrived on the 18th Saturday night. The night Manager was very helpful and booked us into our rooms quickly and with no fuss. The bar downstairs was closed but town was still open we got back at 6.30. We found Susies bar downstairs in the morning - 12 o'clock it was clean and tidy and it had Alun and his mum Susie. Good home cooked food with good service and after day two he knew all our drinks. The hotel was slightly out of the way which suited us all and our ages ranged from 18 to 42. I had an absolute ball and will definitely go back to the Hotel and the lovely clean pool again. Roll on next May. I feel the 'marks' I have given the Hotel are fair and accurate. when we visited the sol y vera we didnt realise it was down a side alley way and we had at least 50 steps to climb to get to the reception ,i found the staff to be not so helpful no hello or thye didnt make you feeel welcome. the hotel told us on arrival that our room hadnt been cleaned as we arrived about lunch tim e,however we left our luggage in the hotel room which is not locked and the room is very tiny and all suitcases were pilled on top of each other and thrown in. there is no lock on the door so dont leave anything valuable in there incase it goes walkies ! anyway so we went to tom brown and had linch there . we got back and the lift was so tiny you can only fit 2 small suitcases and 1 person in the lift! the room itself was clean but the beds are like rocks to sleep on and the pillows are hard too. the pool, at the side is so small and theres about 10 sunloungers to the hotel ,there is no bar and no hotel bar .dont come back too late from your night out cos they lock the door and this really old guy sits in the chair anf watches your every move when you come in,but to be fair he has nothing else to do. the reception is basic but clean and i found my stay to be ok . if i was to come again i woukd like to book somewhere else but if i didnt have a choice i would come again as i have been before. now i didnt find the hotel to be noisey as it was october 2008 i went .just a few nutters coimg back in the early hours after a night out but signs are up everywhere about noise so thats not a problem. i went with my 50 year old mother in law and im 30 so we arent oldies and love the buzz of magaluf. alof of 50 plus people in magaluf this time of year ! get to manos and tom browns for cheap ness !! Even in October these apartments are overrun with numb brains, who can find nothing better to do than slam doors and scream and shout running up and down corridoors till all hours of the morning.Apartmets are dirty linen is dirty and the towells are dirty didnt get the room cleaned once in our ten night stay,managed to grab some cleanish towells from the maids trolley one day when she wasnt looking.So if you value your sanity dont even think about going to the sol y vera apartments the best i can compare it with is a mental institution. Myself and 8 mates have just returned from a funny weekend in the Sol y Vera. We went there to celebrate my stag party. The rooms are basic but really good. The pool area was clean so we spent most of our time in there having a laugh! also the beach is only 5 min walk. The staff are very friendly. Would recommend it for parties and we will definately be booking next year as the nightlife is really good. I am coming twice a year in May and October with my family. For what you pay this hotel is a good value. The rooms are spacious, clean and well-equiped, and in a good location for shops and bars, the beach is just 200m away. We had a nice week staying at the Sol y Vera!!! For what you pay this hotel is really good value. I would definately recommend it!!!! Magaluf is the most amazing holiday I've been on! We went as a group of five lads all around age 2. The Sol y Vera is lovely, reception is very welcoming, staff friendly, very very cheap and location was really good. We've spent really nice days there! hope to come back next year!! We stayed in a elf catering apartment but had to wait until three o' clock in the afternoon before being given the keys to our apartment becuase it was being cleaned apparently. When we eventually got into the apartment is had not been properly cleaned, the bins had not been emptied and contained food, cigarette ash and condomns. The staff were extremely unhelpful, when we needed to ask a question in the evening, there was no one actually on reception for hours. We were checked out the following morning by a cleaner who forgot to return my passport to me resulting in a 100 Euro round trip to the airport,I didn't even try to complain because I knew i'd get nowhere. The actual room was unclean, the cold tap did not work, the toilet door had no handle or lock. The shower had no curtain. There were two big holes in the bathroom floor filled with rubbish. One of the bedrooms had a huge old sewing machine in it for some reason. It was so loud that we couldn't sleep. There's no air conditioning and we couldn't open any of the windows (most of which were as small as portholes. I would not reccomend this hotel, regardless of how much you pay, you expect basics such as emptied bins and door handles on the toilet?